At the Nash Community College board meeting held Monday, November 19, 2018, Damian Tucker was sworn in by Superior Court Judge Quentin Sumner as a new member of the NCC Board of Trustees. Tucker was appointed by North Carolina Governor Roy Cooper to fill the seat of Keith Harris whose term expired. Harris began serving as a Board member in 2014. “We welcome Mr. Tucker to the Nash Community College Board of Trustees and know his presence will be of great benefit to the board and Nash County community,” NCC President Dr. Bill Carver said. Upon graduating with a Juris Doctorate degree in 1998 from North Carolina Central University School of Law, Damian began his legal career as Assistant District Attorney for Nash, Edgecombe and Wilson counties. After serving three years as a prosecutor, he joined the law firm of Hester & Tucker, PLLC in 2001 and became a partner in 2007. With extensive jury trial experience, his sole concentration is criminal defense within the Seventh Judicial District. A lifelong resident of Nash County, Damian, his wife, Chandra, and son, Nicholas live in the Dortches community. He is actively involved in community youth outreach efforts and serves on the Nash UNC Health Care Board of Directors. In addition to appointment by the North Carolina Governor, Nash Community College trustees may be appointed by Nash County Commissioners and Nash-Rocky Mount School Board for a four-year term and may serve longer if re-appointed. 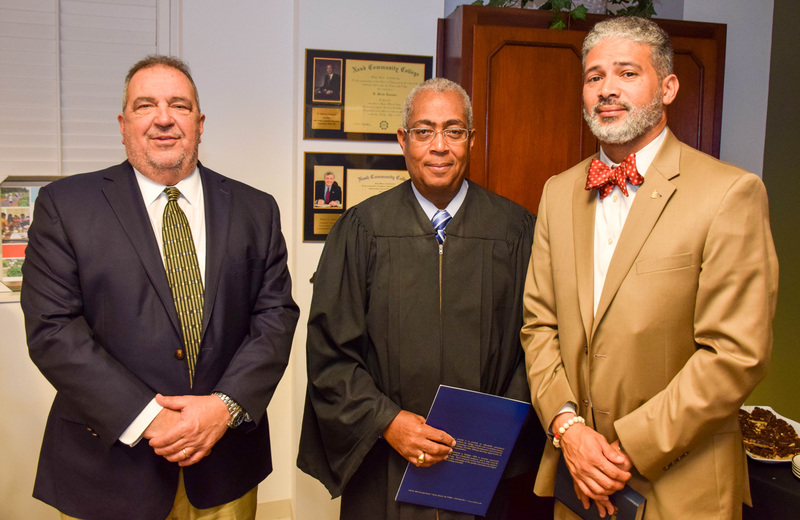 Pictured from left: NCC Board Chair Paul Jaber, Judge Quentin Sumner, and Damian Tucker.